Justin Fontaine has been transferred to a local hospital following a crash at Daytona on Saturday, according to multiple reports. Halifax Health Medical Center says Justin Fontaine is in stable condition in the emergency room. 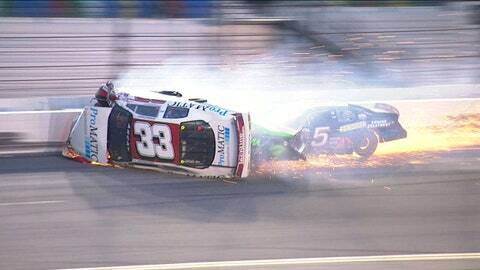 The incident took place in the closing laps of the Lucas Oil Complete Engine Treatment 200 Driven by General Tire at the Daytona International Speedway in Daytona Beach, Florida. The race served as the season opener for the 2017 ARCA Racing Series presented by Menards. Fontaine was involved in a three-car incident with five laps to go. His No. 33 ProMatic Automation Toyota was turned hard into the outside wall before rolling upside down on the front straight. Emergency workers checked that Fontaine was responsive before gradually rolling his car back onto its wheels. While Fontaine was moving inside the car, emergency workers had to cut the roof off to extract him from his vehicle before transferring him to a local hospital. The race was not restarted due to damage to the SAFER barrier. Austin Theriault was declared the race winner.